Back Row (L to R): Tony Mansfield, Dermot Walsh, Patrick Veale, Eoin Murray, James Brennan, Dermot Ryan, John O'Donoghue, Johnny Shields, Richie Duggan, Jimmy Stacey, 'Chopper' Hayes, Dwain Moore, Jason O'Donovan, Joe Power. Front Row (L to R): Tom Whelan, Gavin Breen, Alan Landers, Jonathan Moore, Damien Cliffe, Brian Beatty, Michael Enright, Brendan Landers, Paudie Shields, Fergal Cunningham, Brendan Flynn. 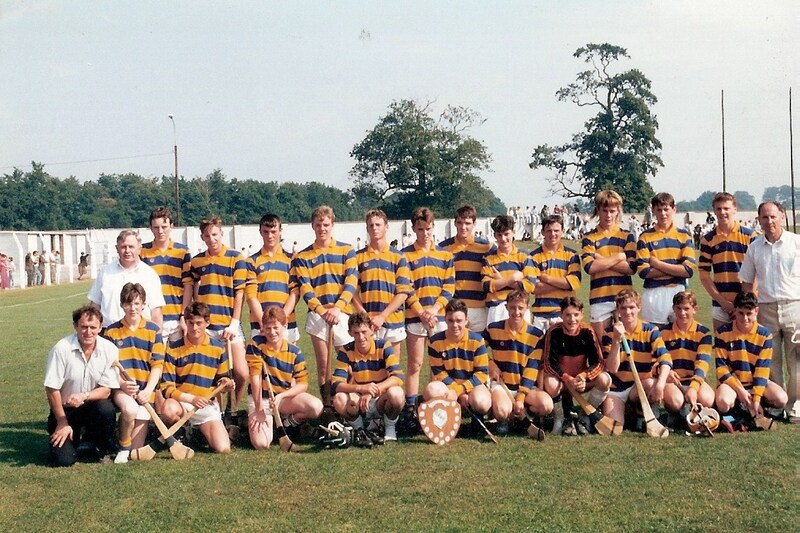 This week's photo shows the Abbeyside Minor Hurling team that captured the 1991 Western 'B' title at Cappoquin. 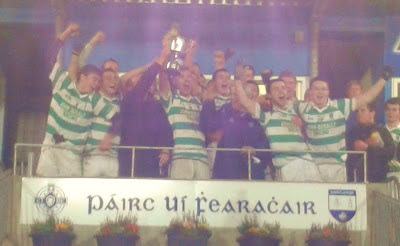 The County title was won at Walsh Park in the weeks that followed. Our popular Jack the Joker Fundraiser will continue this Sunday night in Kennedy’s Live where the Jackpot will be €9,580 as on Sunday night Martina Power was drawn out of the drum but did not find the Joker, however she did win €50, while Michael Kiely and Shane Lehane won €25. The following are the numbers that haven’t been turned yet 3, 9, 11, 12, 17, 18, 23, 26, 30, 32, 34, 39, 40, 41, 42, 43, 44, 45, 47, 48, 49, 50, 51, 52, 53. We take on Rathgormack in The County Final tonight, Wednesday March 27th at 7:30 pm in Fraher Field and all support would be greatly appreciated here. We play our second game of the County Football League this Monday when we play Ballinameela in Ballinameela at 2:30 pm. Our Bingo continues this Sunday night in the CBS Hall where the jackpot is €1250. Last Sunday evening we held our annual quiz in Minnies. A great evening was had by all. A special word of thanks must go to Brendan & Marie O’Brien and Michael Veale who run the quiz each year and without their help it would not be possible. To Pat O’Brien and staff for allowing us the use of their premises. To all who gave us spot prizes we say a big thank you. The annual Kelloggs GAA Cul camps will again take place in Abbeyside from the 1st of July to the 5th. Online booking goes live on April 1st where a €5 discount applies with tokens from Kelloggs cereal boxes. More information can be got by going to www.kelloggsculcamps.gaa.ie/ or contacting your club coordinator Carmel on 0872598923. Best of luck to the Friary College as they bid for All Ireland success on Saturday on the football field. The side is captained by Brian Looby the club is also represented by Michael Maher, Conor Prunty, Kevin Dwane, Eoin Kiely, Kevin Dee and Eamon Crotty. Membership is now overdue and we would ask that all forms and monies are returned as soon as possible. Our under 16 hurling squad have their first outing in the county championship on this Monday coming the 1st April away to Ballyduff Lower. Support would be greatly appreciated. Our second team for the under 14s began their campaign last weekend. After a brave performance defeat was their lot against Ballyduff. With such a young team it was fantastic to see the commitment and courage of this group of players. Our first team’s match against Dungarvan was cancelled last Sunday morning but they have topped the group which automatically qualified them for the western final. NOTE TO PARENTS: There will be no indoor hurling training this Friday in the Friary hall due to it being Good Friday. Back Row (L to R): D. Enright, B. Cullinan, J. Allen, L. Dower, J. Crotty (Capt. ), A. Hayes, J. Nagle, P. Feeney. Front Row (L to R): J. Cashin, J. Enright, L. O'Dea, P. Shanahan, J. Clancy, P. Clancy, M. Burke. This week's photo shows the Abbeyside Minor Football team that completed a three-in-a-row of County Championship wins in 1952. Controversy surrounded the Western Final where Cappoquin arrived late with the game being awarded to Abbeyside. The Western Board sanctioned a replay but were overruled by the County Board who gave the game to Abbeyside. In the County Final, the Village boys won a tight contest, 3-1 to 2-2 against Na Risigh. Despite the fact that it is over a week now since Tony passed away, the news of his passing still does not seem to have sunk in with us all in the club. Talking to many people at his funeral and burial the one thing that most people seemed to say was that we all felt that Tony would be actively working in our club forever, such was the time he dedicated to our club throughout his life. Whilst Tony had a keen interest in the GAA at all levels it was the club that was everything to Tony, and not just his beloved Abbeyside / Ballinacourty. Tony was passionate about protecting clubs from what he saw was an ever increasing over emphasis on inter county activity which impacted negatively on clubs in many ways. At County Board meetings where Tony kept a variety of Chairmen on their toes, he would scrutinise every proposal, checking to see how it might impact on the clubs of the county and if he felt that it would damage the clubs in any way you can be sure that he would fight it tooth and nail!!! Writing in The Sunday Independent in 2003 Colm O’Rourke wrote an excellent article about the role of the club in the GAA. Describing the work of the club volunteers he said “Give any half decent clubman a choice between his club winning a Junior Championship and his County winning the All Ireland and it is no contest. The club win every time and rightly so - every savage should love his native shore.” This was very much true of Tony Mansfield as despite his great love for Waterford it was always Abbeyside / Ballinacourty first. Tony first became involved as a player with our club over 70 years ago as his name was posted on a list of under 14s who were called in for training for the upcoming championship. I’m sure little did he realise then as sprightly 12 year old that for the 70 years or so his life would be consumed by the GAA. Tony’s first recorded success in our club history book, came in 1955 when he was wing back on the club minor hurling team that won the Western Championship defeating Cappoquin Rovers in the final 3:07 to 0:05. Unfortunately they were defeated by Na Risigh (Mt.Sion) in the County Final but this was the first of many victories for our club featuring Tony Mansfield. The following year Tony played on the Abbeyside Senior hurling team that recorded a famous victory over Tourin in Cappoquin. A victory over Fourmilewater in the next round set up a County Semi Final clash with Mt.Sion who ended Abbeyside’s interest in the Championship on a scoreline of 6:10 to 5:02. In 1957 Tony was again on the club minor team that defeated Cappoquin in the Western Final and advanced to the County Final where once again Na Risigh awaited the Villagers. Unfortunately Tony was sick for the County Final and unable to play and his absence was too big a loss to the team who were narrowly defeated. Following Waterford’s appearance in the All Ireland Senior final in 1957 Abbeyside produced a fantastic display of hurling to shock Erins Own in the County Semi Final and advance to the County Final with a young Tony Mansfield playing at corner back whilst still a minor. Despite giving their best Abbeyside were defeated by an exceptional Mt. Sion team which included the likes of Phil Grimes, Seamus Power, Larry Guinan and Frankie Walsh. In 1958 Abbeyside entered a football team of their own and Tony lined out in goal but 1958 is more significant for the fact that it was the year that Tony joined the club committee marking the start of a remarkable career in club administration. 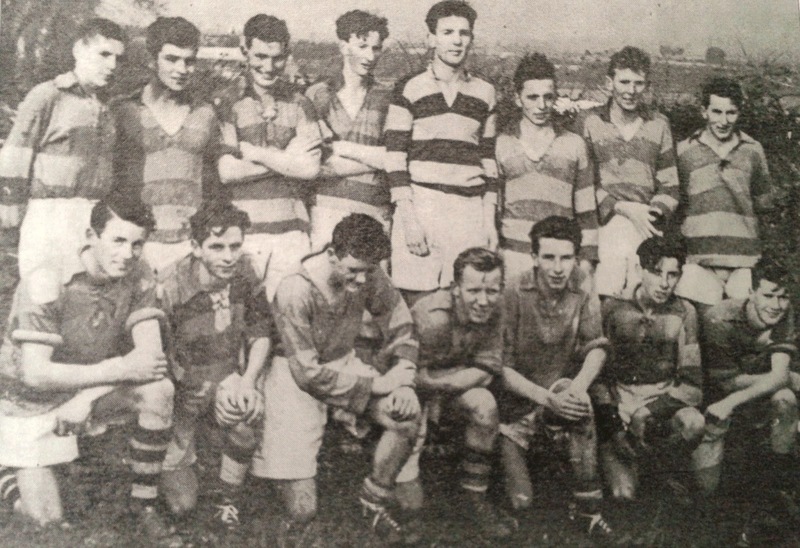 1959 began with a meeting that certainly encompassed Tony’s desire to unite the parish clubs as he was part of a delegation that met the officers of the Ballinacourty Club officers where it was agreed that Abbeyside would not enter an adult football team that year, thus sowing the seeds for the future amalgamation of the clubs. It was to get even better for the club that year as on December 20th the club defeated Tramore in the Minor Football County final on the remarkable scoreline of 0:01 to 0:00. Along with his fellow selectors Tony, who was team trainer, introduced 15 year old Austin Cashin at top of the right at half time and with only eight minutes remaining it was the young Cashin who scored that winning point!! Thus the decade concluded with Tony leading the club to a County Title for the first time with many more to come and for good measure he was also Assistant Secretary to his great friend Seamus O’Brien. This was an administrative double act that would serve the club for many years to come. The 1960’s began with Tony very much continuing to push for the amalgamation of the two clubs and at the Ballinacourty AGM in 1960 he was elected on to their club committee following a request from the Abbeyside club. 1960 was also the year when the first official divisional under 16 hurling championship took place and following victories over Ardmore, Fourmilewater and Dungarvan, Abbeyside defeated Cappoquin in the Western Final in Lismore on a score line of 4:07 to 3:01. Despite Tony’s best efforts as team trainer they were beaten in the County Final by Mt.Sion. In 1961 the Western Title was retained but unfortunately De La Salle proved too hot to handle in the County Final. 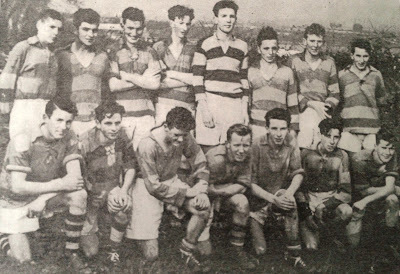 1962 was another historic year for the club as Ballinacourty won their first title, in the form of the Western Junior Football League with Tony lining out at wing back. Also in 1962 the Club’s good run in under 16 continued where with Tony as coach they won the Divisional Double but unfortunately the bad luck in County Finals continued. 1963 saw Ballinacourty enter a second football team for the first time and throughout his time in the club entering Junior teams to ensure that every player got games, was something that Tony believed strongly in. Also in ’63 Tony trained the Minor Footballers who were defeated by Tramore in the County Final. 1964 saw Abbeyside back in the County Senior Hurling Final where Tony lined out at wing forward, and despite being rank outsiders against Mt.Sion the team put up a heroic effort before being beaten by two goals. 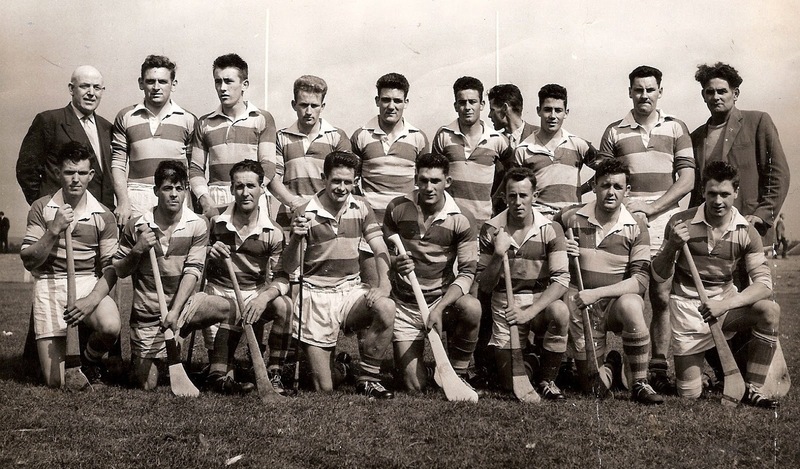 The year did finish on a good note as the Senior Hurlers claimed the first official title since entering the Senior Ranks in 1951, as they won the 1963 Sargent Cup. The following year it was the turn of Ballinacourty to shine on the playing fields as they won the County Intermediate Football title defeating Rathgormack in the County Final where Tony lined out at corner forward whilst he was also team trainer as well as being the Ballinacourty Secretary!! The success kept on coming in 1966 when the club won the first ever U21 Hurling Championship defeating a hotly fancied De La Salle side in the County Final and throughout his coaching career the under 21 grade was on that Tony placed a great emphasis on. 1967 saw Tony’s efforts to unite the clubs of our parish come to fruition as they finally amalgamated with Tony serving as the club’s very first Secretary. At the AGM in 1969 Tony was elected as Club Chairman and this decision proved to be a shrewd one as the club went on to have a great year winning club of the year for the very first time. On the field of play Tony was still performing and he was on the Senior Hurling team that shocked County Champions Ballygunner in the County Semi Final, but that old bogey team Mt Sion lay in wait in the County Final and inflicted yet another defeat on the club. If the sixties had ended well, the seventies got off to an even better start as with Tony still serving as Club Chairman the Club won the Club of the Year accolade for the second time. Tony was trainer to the minor side who recorded a historic County Double and also to the under 21 footballers who won a divisional double with the footballers going on to beat John Mitchells in the County final but unfortunately the hurlers were beaten by a strong Ferrybank side in the County Final. As if that wasn’t enough Tony also trained the under 14 hurlers who won the first ever divisional championship defeating Tallow in the Final. This was part of a great rivalry that was building up between Abbeyside and Tallow as the sides would clash in numerous Western Championship finals. No doubt Tony and Ned Power were putting into action the skills they had acquired at the Coaching Courses in Gormanstown College in 1965. 1971 saw more new ground broken in the club as firstly extensive improvement works were carried out in the club grounds under Tony’s watchful eye as Chairman. Success on the playing fields continued with the under footballers retaining the County Title and the under 16 footballers winning the first ever County Title for the club in this grade. 1972 saw the emergence of a great under 14 team in the club and under Tony’s guidance they won a Western Double going on to defeat Roanmore in the County Final. The following year finally saw the Mt. Sion bogey laid to rest as the under 16 hurlers defeated the Monastery side in the County Final to claim another historic first for the club. In 1974 Tony stepped down a Club Chairman but continued his success on the coaching front as the under 16s won a divisional double going on to defeat Roanmore in the County Final. In 1976 that promising bunch of under 14s from 1972 won a historic Minor County Double defeating Roanmore in the hurling County Final and Cuchullainn in the football final. 1977 saw the club win the under 14 football County Title and this victory saw Tony complete the clean sweep of underage County Titles as coach. Interestingly when Jim Morrissey went up to receive the cup, who was waiting to present it him only Tony, who at this time was Chairman of County Board na nÓg. Having led the club to so much underage success it was only natural that Tony would be involved when the club finally won the County Senior Football title, and that dream was finally fulfilled when they defeated Clashmore in the County Final on a score of 0:13 to 2:04. They say it takes a good team to win a title and a great one to retain it so it was only fitting that in 1979 that the title was retained with victory over Ferrybank in the County Final with the club also being named Club of the Year. Whilst the County Championship was surrendered in 1980 the side showed great commitment and determination to reclaim it in 1981 with Tony once again as team manager. Tony continued to train teams in the club for many more years and whilst they may not have had the success of the previous two decades they were always meticulously prepared for the battle. In 1990 Tony was manager to the under 16 hurlers that won a County Title, and in 1994 he was manager of our Intermediate Hurlers who were defeated in the replayed County Final. In the mid 1990’s Tony again saw the need in the club to enter a third football team and over the course of a number of years he headed up this team winning Divisional Honors. Tony was always a proud Waterford man and the County certainly benefitted from his time and commitment in many ways. As a player Tony was a member of the County Panel for a number of years and he was on the panel for the 1963 All Ireland Final. When he finished playing Tony took up refereeing and went on to referee County Senior Finals. 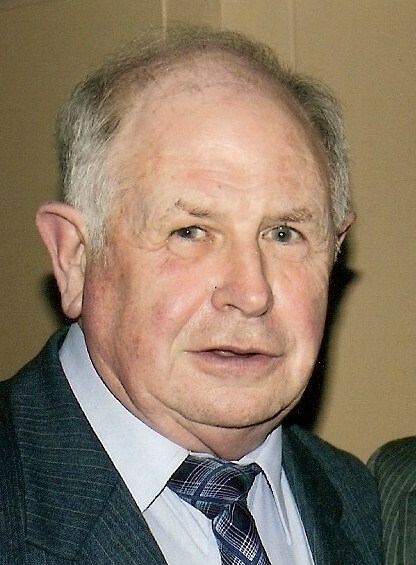 On the administrative front he served as Chairman of County Bord na nÓg for five years putting in place structures that ensured the smooth and efficient running of the underage championships. At his side throughout this time was Vincent Mulligan who if anything was even more efficient than Tony and helped him greatly in re-organising the Board. But it is a team manager that Tony made his greatest Contribution to the County. In 1974 he was manager of the County Under 21 team that were defeated in the All Ireland Final and in the late 1980’s with the county teams fortunes at rock bottom he took over the County Senior side and over the course of three years he resurrected the County from division four hurling to division one. Tony was presented with a National Manager of the Month award in 1987 in recognition of his great work. In 1989 he was at the helm as Waterford defeated Cork in a replay to qualify for the Munster Final. 1992 saw what was undoubtedly his proudest day as in Nowlan Park the County under 21 hurlers defeated Offaly to claim a historic All Ireland title after a replay. 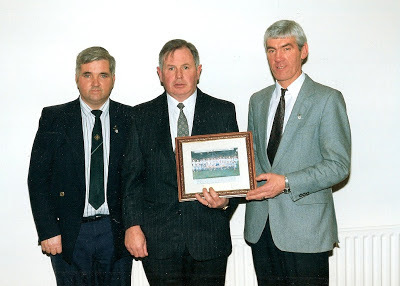 In the mid 1990’s Tony returned as County Senior Manager and in the late 90’s he again took charge of the under 21 side for three years during this time many of the stars of the Waterford Senior team of the past decade first came to public attention. Through his weekly newspaper column Tony shared his thoughts on GAA affairs at local and national level. When reporting on games Tony never sought to be sensationalist or to seek popularity, just to give an accurate and fair account of the game whilst always trying to present the GAA in the best possible light. He would try to give every club the best possible treatment and would regularly hand out old photos at County Board Meetings seeking names of the teams included in the photos. Once again for Tony it was always about trying to help clubs in any way possible. With our club’s fortunes at a bit of a low ebb at the end of the 1990’s Tony again answered the call to help the club, returning as Chairman, a position he held until his passing. Tony set about reorgainising the club on a variety of fronts. On the administrative front he held regular club meetings and thanks to diligent planning turned the club finances around ensuring that the club was always kept in the black. As previously mentioned the under 21 grade was one very close to Tony’s heart and he priortised this Championship in the Club to help bring our under age players through to play Senior. Tony still felt he had something left to offer on the Coaching side and he led our Junior Hurlers to two County Titles continuing to work with the Intermediate side which also helped bring more young players through to play Senior Hurling and Football. It is worth noting that since his return as Chairman 13 years ago the club have won 49 Western and 36 County Titles, showing clearly how a well-run club can lead to success on the playing fields. The highlight of this time must surely be the victory over Kilcummin in Killarney in 2007 in the Munster Club Football Championship, when after the game Tony was in his element dealing with all the media enquires as to who were Ballinacourty. 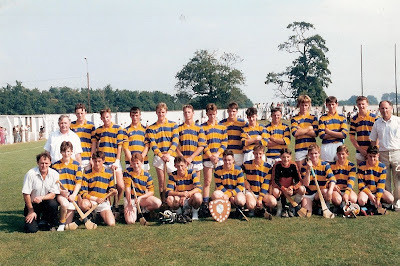 The club also returned to the ranks of Senior Hurling during Tony’s tenure and won the Club of the Year accolade on two occasions. Yet, perhaps his greatest legacy to us is the re-development work that has taken place in our grounds in recent years. Throughout this work Tony was always careful not to place too great a financial burden on the club but at the same time he was determined to have the best facilities in place for our players. The installation of state of the art flood lighting brought him great satisfaction, as did news before Christmas that we has received a grant to help construct a ball alley. However it was the acquisition of a new club pitch that brought him most pleasure as it had been a burning ambition of Tony’s to get extra land for the club for some time. Despite being unwell in recent weeks he kept himself fully up to date with the negotiations and was thrilled to hear that the negotiations finally proved fruitful. Up until his final moments it was the future of Abbeyside / Ballinacourty that occupied his mind. I hope that this tribute goes some way to illustrating the remarkable contribution that Tony Mansfield made to our club. No doubt there are some things which I have left out as in a life as full as the one Tony lived it would not be possible to cover every aspect of Tony’s time in our club. As I said last week it is his great friendship, loyalty and always sound advice that we will miss the most. We have lost a true legend of the GAA from our midst and it behoves us all to endeavour to make our club the best that it possibly can be, continuing to work in the spirit that Tony did for so many years. Our popular Jack the Joker Fundraiser will continue this Sunday night in Kennedy’s Live where the Jackpot will be €9,308 as on Sunday night James, Jack and Joey were drawn out of the drum but did not find the Joker, however they did win €50, while Dennis Cosgrave and Pat Grant won €25. The following are the numbers that haven’t been turned yet 2, 3, 9, 11, 12, 17, 18, 23, 26, 30, 32, 34, 39, 40, 41, 42, 43, 44, 45, 47, 48, 49, 50, 51, 52, 53. On Friday night last we defeated St.Olivers in the Western Final on a scoreline of 2:12 to 1:12. This was a cracking game of football and despite building up a big lead twice during the game we had to withstand a fierce comeback from our opponents to retain our Divisional Title. This victory was a great boost to all in the club coming so soon after the passing of our Club Chairman and team captain Ronan Sheehan paid a fitting tribute to Tony in his acceptance speech. We now move on to face Rathgormack in the County Final on Wednesday night next. TEAM: P. CASHIN, S. O’CONNOR, B. LOOBY, S. O’GORMAN, E. BERGIN, D. COLLINS, A. KEANE, R. SHEEHAN, R. DUNFORD, B. HENLEY, E. COLLINS, D. SWEENEY, R. PROCTOR, C. KINDREGAN, M. MAHER. SUBS: D. RYAN, M. RAHER, P. COLLINS, T. McGRATH. On behalf of all in the club we would like to congratulate Niamh Briggs on her fantastic achievement of being part of the historic Ireland Ladies Rugby team who won the Grand Slam on Sunday with victory over Italy. Niamh scored all of Ireland’s points on the day and emerged as the top points scorer in the Championship. Niamh is an all-round sports star as she played football for many years for our Ladies team as well as the County team and we look forward to following her sporting career for many years to come. Congratulations and best wishes to Oisin Hallahan who competed in the solo singing section of Scór na bPáistí representing our club last weekend. He qualified for the County finals to take place on Sunday evening next in Cappoquin. Best of luck to Dungarvan Colleges who take on St. Kieran’s of Kilkenny in the All Ireland Semi Final of the Dr. Croke Cup this weekend. Abbeyside club has five lads on this panel and we wish them all the best of luck. Well done to our young boys and their mentors who took part in the St. Patricks Day Parade. They carried our club colours with pride and it was wonderful to see so many taking part. Indoor hurling coaching continues this Friday coming in the Friary College gym starting at 6 pm for five and six year olds. Both our under 14 teams were due to have games last weekend. The division 1 team played at home to Naomh Bríd and played some nice football to win the game. Our division 3 team were also due to play but they received a walkover. The juvenile club is running a fun family table quiz on the 24th of March in Minnies beginning at 5pm. This promises to be a fantastic event and certainly not one to be missed. This quiz is aimed at families where both adults and children can get involved and where fun is the most important aspect. PLEASE NOTE THE CHANGE OF TIME FROM 3 O CLOCK TO FIVE O CLOCK. A great day was had by all on St. Patrick’s Day as the girls marched through the Village and on to Grattan Square. They sang their hearts out as they went. On behalf of all in the Camogie club we would like to express our sincere sympathies to the Mansfield family on the death of Tony. Tony was instrumental on getting the Camogie club up and running. Training will be returning next week. Teamers will be sent to all groups about time and day. On Sunday night last, the sad news that our esteemed and much loved Club Chairman Tony Mansfield, had passed to his eternal reward, left all in our club with a deep sense of loss, as for the vast majority in our club we have never known the club without Tony. For many in our club he was the first coach they had in the club, the only chairman they knew or can remember having but for us all he was a constant presence in our club and one that will be sorely missed. However our sense of loss can only pale into insignificance when compared to the loss being felt by his wife and great friend Moira, daughter Caroline and sons Michael and Brendan. To them and all of Tony’s extended family we send not alone our deepest sympathy but also our thanks for the help and support they gave Tony, which no doubt enabled him to devote so much of his time to the service of our club, something for which we will be eternally grateful. To say that Tony was a passionate GAA man would be an understatement, and to say that he was passionate about his beloved Abbeyside/Ballinacourty GAA Club would be even more of an understatement. He served our Club and County as player, administrator, coach, manager and mentor, whilst he also took up refereeing when he retired from playing. Throughout this time Tony built up a reputation as an excellent reporter and commentator on the GAA through his column in The Dungarvan Observer. It is for his work with our Club, that all of us in Abbeyside/Ballinacourty will remember him most fondly for. To describe him as a great servant to our club does not even come near doing justice to his contribution to our club. From when he played in the Minor Hurling County Final in 1955 as an Under 16, Tony went on to bring unparalleled success to our club on the playing fields. No matter what title you think of, you can be practically guaranteed that the first time the name of Abbeyside or Ballinacourty was inscribed on the Cup, Tony Mansfield had an input into the victory. Due to time constraints, I feel it was not possible to do the work of Tony justice in this week’s notes, so next week we will carry a full and fitting tribute to the lifetime of service he gave for the betterment of our club. One fact that is worth noting though, from when he guided our Minor Footballers to a County Title in 1959 he managed teams to County titles in no fewer than six decades. This remarkable achievement gives some small insight into the lifetime’s dedication he gave to our club. To those who knew Tony well it is perhaps his calming influence, advice and counsel and most of all good friendship that we will miss the most. There are very few, if any of us who didn’t place a call to Sexton Street (where it was often answered by his unpaid secretary!!) seeking advice about opponents, the picking of a team, fixtures being changed or a myriad of other difficulties involving team management. Tony always made you feel at ease offering sound advice, normally with at least a story or two from his own extensive experience of dealing with a similar problem before going on to offer a solution that was usually the correct one. Without doubt we will never see his like again in our club and all we can seek to do is carry out our duties as club players, coaches, managers or administrators with the same pride and dedication he did to ensure that the marvelous legacy he left us is built on into the future. Ar dheis lámh Dé go raibh a hanam usail. Our popular Jack the Joker Fundraiser will continue this Sunday night in Kennedy’s Live where the Jackpot will be €9,096 as on Sunday night Ann Kelleher was drawn out of the drum but did not find the Joker, however she did win €50, while Naimh Briggs and Mary Cliffe won €25. The following are the numbers that haven’t been turned yet 2, 3, 9, 11, 12, 14, 17, 18, 23, 26, 30, 32, 34, 39, 40, 41, 42, 43, 44, 45, 47, 48, 49, 50, 51, 52, 53. It was great to see Niamh Briggs continue her winning ways in The Joker as unless you were living under a rock for the past few weeks then you would no doubt be aware that Niamh has been in fantastic form for the Ireland Ladies Rugby Team who secured the Six Nations Championship with a win over France on Friday night with Niamh scoring a try. They now go in search of a grand slam against Italy this weekend and we wish Niamh and all her team mates the very best of luck with this. This Friday night we take on St. Oliver’s in Fraher Field at 8pm in the Western Final where all support would be greatly appreciated. Our Bingo continues this Sunday night in the CBS Hall where we will host a bonus night with a top prize of €500 on the night. Next week we are at home to Naomh Brid and away to Cappoquin. We played the Brickies in Bushy Park on Saturday morning last in the 4th round of the under 14 football and came away with the win. Our second team finally got their championship off to a start Saturday evening at home to Stradbally where we registered our first points. Panel: Aaron Beresford, Tommy Walsh, Shane Ahearne, Cian Fagan, Padraig Moore, Bearach Moore, Gearoid Hallinan, Tom Looby, Sean Crotty, Sean Whelan-Barrett, Shane Kiely, Ben Flynn, James Riordan, Jack Kiely, David Montgomery, Dean Beresford , Jamie Walsh, Mark Twomey, Meldan Dwyer, Daithi Brunnock, Johnny Treen, Michael Kiely, Sean Kent, Eoin Flynn , John Power, Jack Dwane, Cian Power, Alec Norris, Jack Riordan, David Hayes, Michael Troy, Colin Foley, Eoin Ahearne, Ethan Raher, Senan Travers. On Sunday last we played our second game in the county minor football championship. In near unplayable conditions our lads played some good football and came away with a battling win. Our next match at this level will be this Sunday morning when we take on Dungarvan in a rescheduled fixture and we wish these lads the best of luck. It was brilliant to see so many underage players from under 8 upwards turn out at our club grounds on Sunday morning last for a trip from Bishopstown in conjunction with their trip to the Waterford - Cork National Hurling League game at the Fraher Field. Conditions were awful on the day with wind and rain being to the forefront. It was remarkable that any games could be played in such awful conditions. While the under 8s were disappointed that their match had to be called off due to the rain the three games of under 12s and two games of mixed under 9s and 10s that went ahead were very skilful matches indeed in the weather conditions. Every ball was fought for like their lives depended on it. To the parents of the under 8s we must apologise for the late notice in calling the under 8 match off but this was outside our control. To everyone else we must thank you all for coming out and playing and even though everyone went home cold everyone seemed to go home happy. Again hurling indoor training continues this Friday night at the Friary College hall starting with the five and six year olds at 6 pm. Helmets will once again be on sale for anybody interested in purchasing one. The juvenile club is running a fun family table quiz on the 24th March in Minnies beginning at 3pm. This promises to be a fantastic event and certainly not one to be missed. This quiz is aimed at families where both adults and children can get involved and where fun is the most important aspect. It was great to see the two local schools reach all Ireland Finals at the weekend. Congratulations to both the Friary and the CBS on their wins and especially our club representatives. We are taking part in this year’s St. Patricks Day Parade. Any of our girls who wishes to walk are asked to meet at Garvey's Coolagh at 2.30pm. Please wrap up well and wear comfortable shoes. CLG Dún na Mainistreach / Baile na Cúirte would like to offer its sincerest sympathies to Moira, Michael, Brendan and Caroline Mansfield and their extended families on the sad death of our Club Chairman, Tony earlier this evening. Tony's passion for, and dedication to, Abbeyside / Ballinacourty GAA Club knew no bounds. His wise counsel, friendship and knowledge of all things GAA will be sorely missed. May he rest in peace. Back Row (L to R): P. Langan, A. Flynn, J. McGrath, J. Browne, M. Keohan, T. Hogan, T. Curran, P. Hogan, D. Whelan, M. Fives. Front Row (L to R): D. Barry, J. Hogan, N. McGovern, T. Mansfield, M. Kiely, T. Landers, L. O'Dea, E. Moore. This week's photo features the Abbeyside Senior Hurling team and mentors that took on Sarsfields at Fraher Field in the second round of the County Senior Hurling Championship. A 2-14 to 2-4 victory qualified the team for the County Semi-Final where the Village men had to give best to Mount Sion on a scoreline of 6-8 to 3-7. Our popular Jack the Joker Fundraiser will continue this Sunday night in Kennedy’s Live where the Jackpot will be €8,870 as on Sunday night Paul Curran was drawn out of the drum but did not find the Joker, however he did win €50, while Barry Goode and Lee O’Donnell won €25. We appeal to all our supporters to continue purchasing the tickets as the funds raised will go towards our ongoing development works at the club grounds. On Saturday afternoon last we defeated Comeragh Gaels in the Western Semi Final in Fraher Field thanks to a very good second half performance. We now advance to the Western Final against St.Olivers on March 15th which takes place in Fraher Field at 8pm. TEAM: P. CASHIN, S. O’CONNOR, B. LOOBY, S. O’GORMAN, E. BERGIN, D. COLLINS, A. KEANE, R. DUNFORD, R. SHEEHAN, D. SWEENEY, E. COLLINS, B. HENLEY, M. MAHER, C. KINDREGAN, R. PROCTOR. SUBS: M. RAHER, P. COLLINS, E. CROTTY, M. FLYNN, J. O’RIORDAN. Our Senior footballers began their County League campaign on Sunday morning last when we welcomed St.Saviours to our club grounds. At the end of an entertaining game of football w the sides were level on a score line of Ballinacourty 2:09 St.Saviours 3:06. TEAM: R. RYAN, M. LAVAN, P. LYNCH, G. BREEN, N. DEE, T. HANRAHAN, J. RYAN, M. O’HALLORAN, C. MOLONEY, S. O’DONOVAN, M. FIVES, M. GORMAN, D. POWER, J. O’BRIEN, C. KINDREGAN. SUBS: D. COLLINS, J. MOORE, L. HURNEY. There was a very encouraging turnout of parents at our Information night in the Friary on Friday night last and we may hold a similar event in our pitch once the outdoor hurling training begins in the coming weeks. Our Bingo continues this Sunday night in the CBS Hall where the jackpot is €1,150. Well done to our club quiz team of Michael Brackett, Packie Hurney, Neil Moore and Jim O’Mahoney who won the county final of the GAA Pub Quiz on Thursday night last in Lawlors Hotel. Last Sunday we played the third round of the under 14 football championship at home. This was against near neighbours Dungarvan. This was a very low scoring game with just 3 scores in total. Our boys battled well in the second half to hold onto a one point win. Final score was 1-0 to 0-2. Next week we are away to Brickies and our second under14 team finally get their championship off to a belated start where we play Stradbally in Abbeyside. Training continues on Tuesday evenings at 7pm. Training continues this Friday evening at 7 pm for our under 16 hurling panel. Championship time is creeping up slowly now so a full attendance is requested. Also any member of the panel who has filled in their membership forms, we would encourage to return as soon as possible. Our minor footballers travel to Roanmore on Sunday morning next for their 2nd game in the county championship for this group of players. All support would be greatly appreciated. The juvenile club is running a fun family table quiz on the 24th of March in Minnies beginning at 3pm. This promises to be a fantastic event and certainly not one to be missed. This quiz is aimed at families where both adults and children can get involved and where fun is the most important aspect. We would like to wish St Augustine’s College and Dungarvan CBS well in their respective All Ireland semi-finals this Saturday and especially all our own players involved. We would also like to congratulate all the children of the parish who were confirmed on Friday and Saturday last. The Burgery will be a hive of activity this Sunday morning the 10th as we are getting a visit from Bishopstown for a number of Juvenile matches. This promises to be a great morning’s hurling. Their visit is part of a trip they have planned to coincide with the Waterford vs Cork National Hurling League match in the Fraher Field. 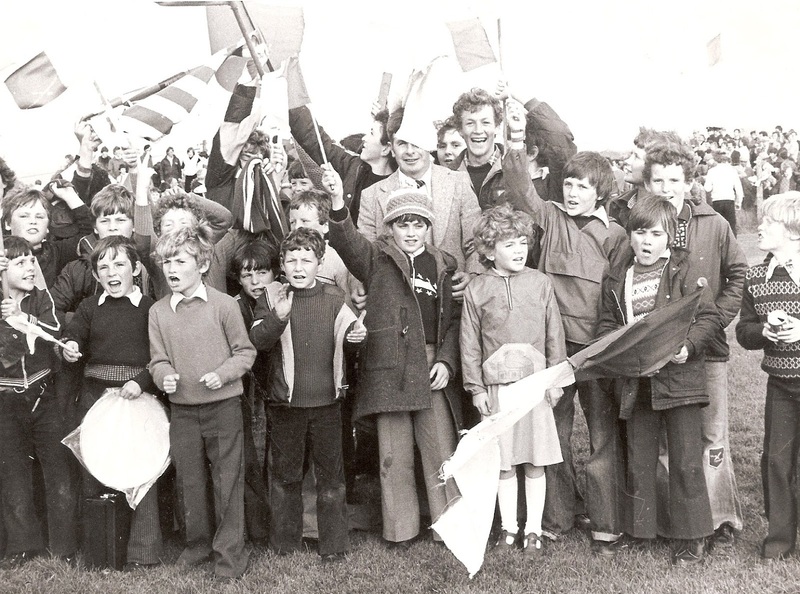 This week's photo shows young supporters joining Tony Mansfield in celebrations following victory in the 1981 County Senior Football Championship Final against Ardmore at Fraher Field.